Philadelphia Eagles quarterback Carson Wentz passes against the Carolina Panthers. 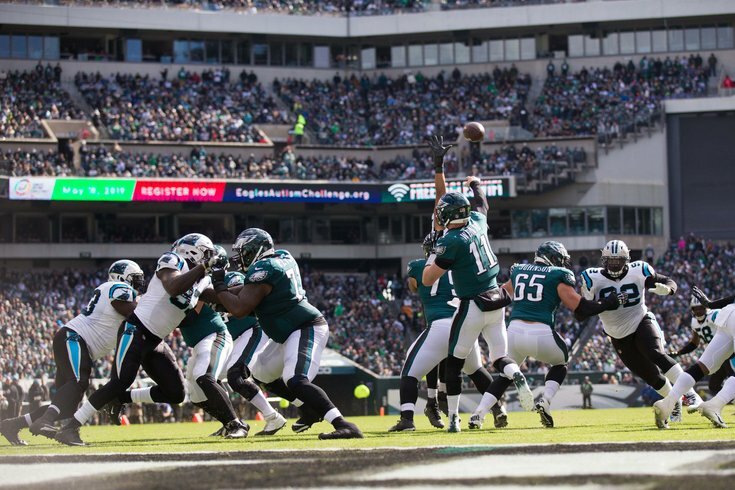 Sunday at 1:00 p.m., the Philadelphia Eagles will take on the Carolina Panthers in a very important NFC matchup, a year after the two teams played a highly entertaining Thursday night game in Carolina, won by the Eagles. One of the themes of the Eagles' season, like in 2017, has been an over-abundance of injuries. Presently, the Eagles have seven notable players on the IR, NFI, or PUP lists, as well as five players on the active roster who have already been ruled out for this game. The Panthers list just one back-of-the-roster player on their injury report, though they do have both of their starting offensive tackles on IR. Here's the final Eagles-Panthers injury report, with analysis. As we noted in our five matchups to watch, the Eagles' pass rush must create pressure against a Panthers offensive line that is playing several backups, while at the same time keeping the elusive Cam Newton from escaping the pocket and making plays with his legs. On the other side of the ball, the Eagles' passing game should be in a good position to attack a vulnerable Panthers defense that is suspect at safety. It is important that the Eagles score early and can then get their running game going. The betting lines opened for this game at Eagles -4, and have since climbed to -4.5. Here are our staff writer picks, as well as who other publications are picking.